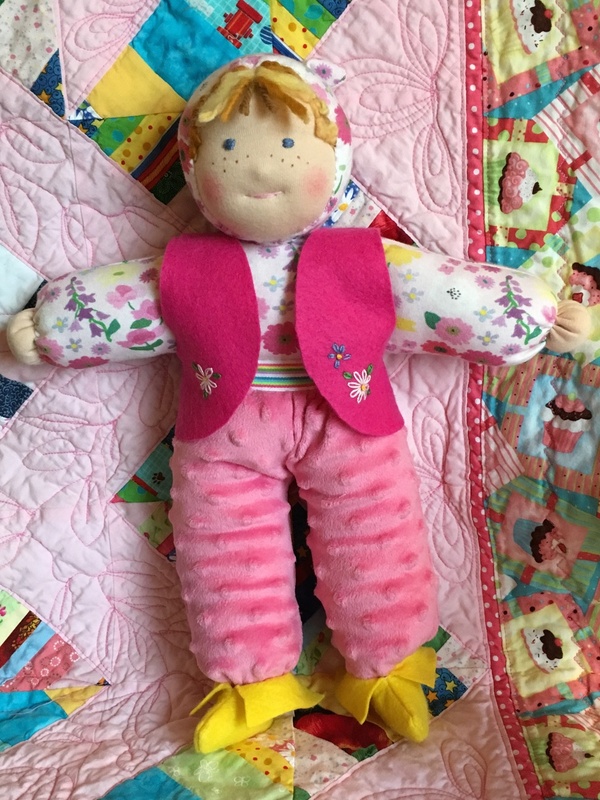 In early December, a friend asked if I had time to make her 12 month old granddaughter a doll. I had a head for a Waldorf type doll that I had made earlier this year, so this was an easy "Yes!" I often draw my own doll patterns but this time I used a pattern from Maricristin Sealey brilliant book, Making Waldorf Dolls, Creative Doll-Making with Children. The pattern had button hands and button feet. I knew this little girl loves taking shoes off dolls, so I did draw a pattern so the doll would have real feet. With this type of soft doll, the clothes are the body. As will all Waldorf type dolls, her head and body are sheep's wool, her trunk and arms are an interlock knit and her legs are a plush polyester fabric which isn't traditional. (Typically cotton velour is the fabric of choice as that is a natural fiber). The book had a pattern for the sweet felt vest and I made a pattern for her elfin boots. The doll is so soft and cuddly. Working on her made me want to go right off and take a nap! !